Want to bet the AVE high speed train line is never completed? Let’s have a little wager, shall we? What’s the betting that the local AVE line is quietly dropped early next year – or, more accurately, the next round of funding is never issued, and the next round of contracts never signed? There are two great AVE projects underway in Spain. 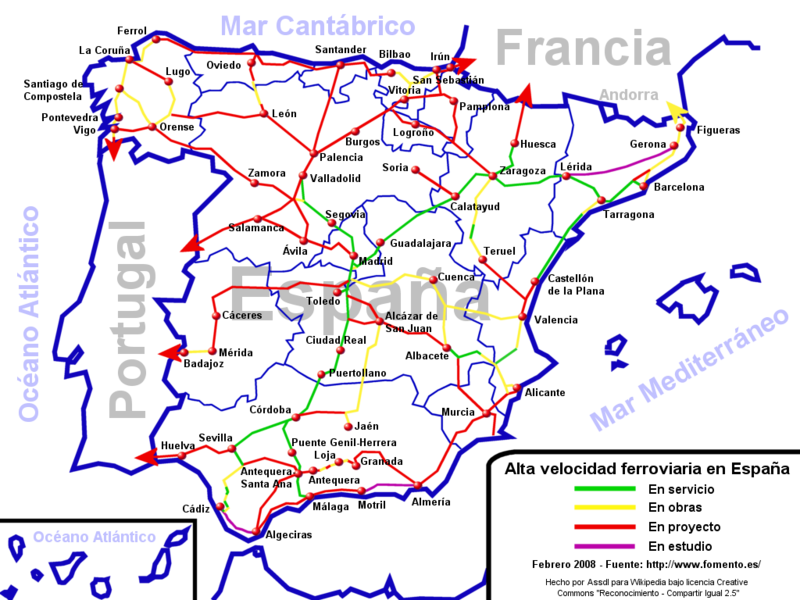 There is the corredor central, which forms part of the great pan European network, from Lisbon to Berlin via Madrid and Paris. Then there is the corredor mediterraneo, which aims to run the network along the coast. Currently, the Madrid – Paris line goes via part of the mediterraneo, via Barcelona. Now, the previous PP administration managed to get the central line declared a major EU investment project (2003). It goes through several huge regions of Spain, links up the rich north and is a valuable railway that connects the industry and population centres of the north and central Spain with Portugal and France. The PSOE, when it came in, was more keen on connecting the populous tourist centres of the south -all important PSOE voting blocs, it must be added- to this network. Which is why we had the Seville – Madrid network. The Malaga – Madrid line. The Valencia – Madrid line. All spokes on a wheel, connecting Madrid with the major cities. The next part of the plan was to connect the “ends” of these spokes with each other. Which is what we see when we look out of our windows in Turre and see a large machine digging a hole. Now, before you scoff at the idea of a major project like this being cancelled, remember that over the summer Portugal cancelled its part of the Lisbon – Madrid route, annoying the hell out of Madrid, which had almost built its bit up to the frontier. Madrid wants this project kick started, as otherwise it has very expensive trains running over very expensive tracks, to some god forsaken station on the border and no further. The PP have already indicated that this is a priority for them to get moving again, with EU funds if possible. And, the corredor central is a “priority” for Europe. Itś the backbone of the railways project. The bits of the corredor mediterraneo that haven’t been built…. aren’t. They’re a national project, being part financed by Europe. But, is there sufficient cash in the bucket to get all of these projects going? Seville has already admitted that it looks unlikely that the Almeria – Granada route will be looked at again until at least 2015, 2016. Remember, this is preliminary planning they’re talking about – the actual construction time from first planning to actually cutting the ribbon could be another 10 or 15 years ontop of that. And Madrid has indicated that Seville will have to stump up a lot of the cash to build the Almeria – Seville connections in between the “spokes”. So why the hell would a new administration, whose first priority is cutting the budget wherever possible, and kickstarting the ailing Spanish economy, be interested in throwing another few billion at a “pork barrel” project that goes nowhere in the back of beyond? The current round of contracts only covers the preparation of the surface from Garrucha to the tunnel, and the tunnel. After all that is finished, the next load of contracts are tendered out and signed for. The tenders are out, the cash is -hypothetically- assigned in the budget for the next few years but nothing is set in stone until the bank transfer is made. When the new contracts land on the desk of the new PP ministers in the new year for the next section of the route, will they hunt down the back of the sofa for the pennies to sign them, or will they slip them to the back of the pile and say that they will think about it in 2014? Especially when Rajoy is storming around the place like a bull roaring “austerity is our new watchword”? The most likely option -for me- is that work will come to a stop once the current contracts finish, and before the next sections are contracted out. There will be a period while everyone argues about it – a year, two years, three years- and then a compromise situation will be arrived at: they’ll finish it off as a standard railway, promising to upgrade it to high speed in the future. Or turn it into a road. This entry was posted in Blog and tagged ave, high speed, turre by David. Bookmark the permalink. Next → Next post: Delicious!